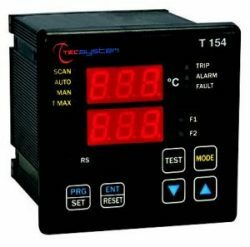 The T154 temperature controller is an electronic microprocessor based unit for the temperature control of low and medium voltage transformers and motors. The T154 is an economical choice to provide temperature control of 3 phase transformer, with a fourth input for the core or ambient temperature. Featuring a dual display with 3 digits for displaying temperatures, messages and channels, along with 3 LEDs to display the state of the alarms of the selected channels and 2 LEDs to display the state of two separate fans, the T154 ensures high levels of protection to electromagnetic interference and ease of use which have made it the standard for this application.